I can't tell you how much I lusted over the Kenzo sweater during AW12 fashion week, I'm a leo and love to pay homage to my inner lioness! To my dismay it was sold out. One month later I found a much cheaper version and since it arrived in the post I have been wearing it continuously. 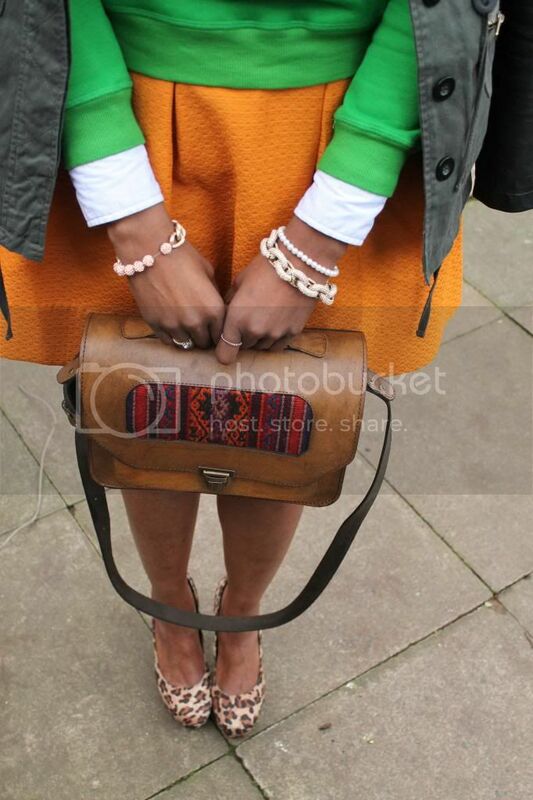 Here I styled it with my tangerine skater skirt (perfect match) and this gorgeous bag from Beara Beara. I absolutely love this satchel, the soft leather, structure and the fact that each bag is individually handmade in Bolivia by the natives just makes it all that more alluring and unique! I absolutely love how you styled this look Marsha. 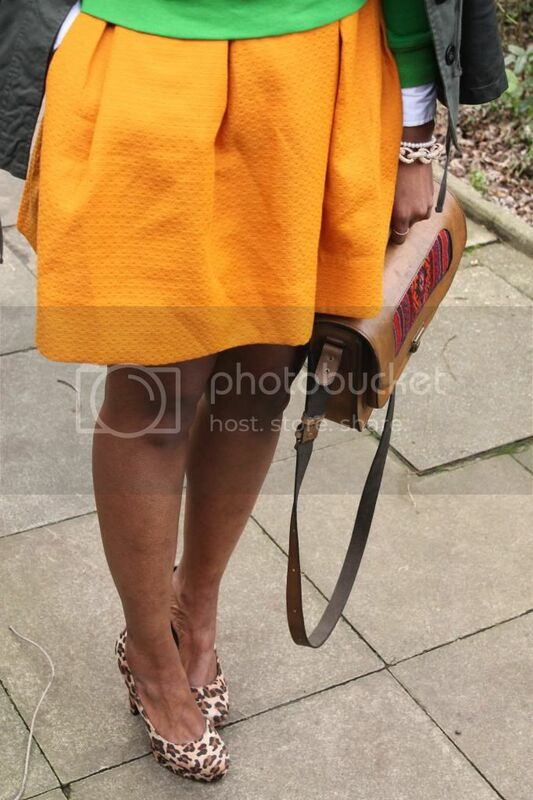 I love the play off the orange by matching that skirt and the loving the added mix of prints with the pumps. It's all just perfect. You look beautiful! perfect match of green and orange! OOOh you got that Kenzo sweater! It looks fab wit ur skirt! Loove it! oh i love love love this, ive been lusting after that kenzo sweater since fashion week too!! Lol, I know right! Was relieved that it was sold out as then I wouldn't have saved as much as I did! Great! I love these bright colours on you!!! i love this jumper!!! cute outfit! Those shoes are amazing! 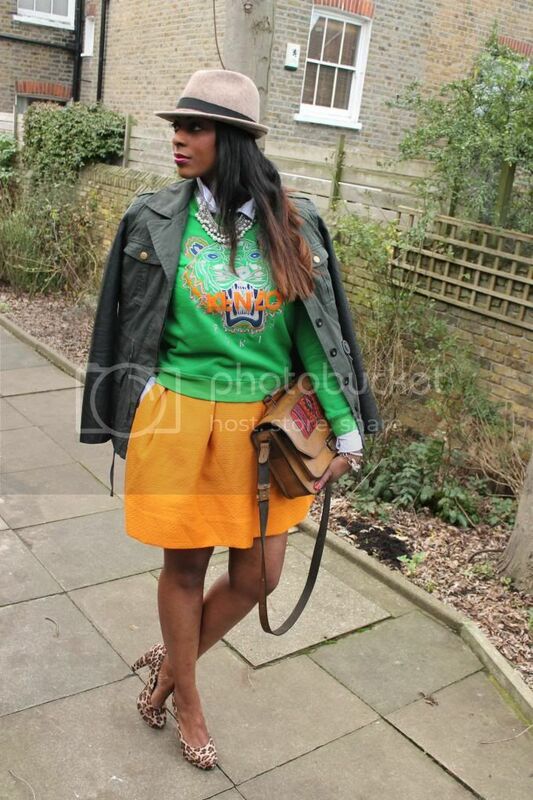 The kenzo sweater is awesome, and it's green so it stands out like crazy with the orange skirt, I love it all! i love that outfit, espically the jumper. This skirt is awsome! want the same!! Great way to bring out your inner lioness. ;) The color combo is perfect! Beautiful! We can follow each other :) Let me know! 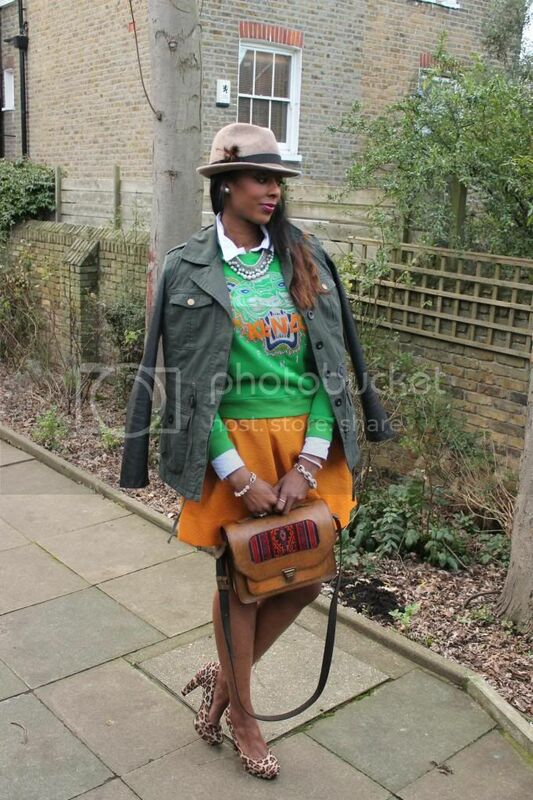 Marsha you look beautiful, I love these colours on you and I need that sweater in my life! I've been obsessed with the Kenzo sweater as well! I wish I could afford one... maybe I'll settle for a cap instead. Loving the combination of colors & patterns here. Nice outfit! I like the leopard print shoes! Love Love Love your ensemble! Freaking love that Kenzo sweater! You look so lovely!